I'm on a Mac, so most of these files were not useful to me. The more interesting files were IM_0001 and ED_0001 with "application/dicom" MIME type. DICOM files stand for Digital Imaging and Communications in Medicine. How to view these on a Mac? OsiriX viewer is an option. OsiriX, though on the heavy side (100.7MB download), it rendered the X-ray successfully. 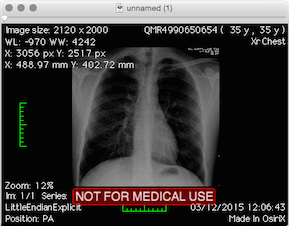 Unsurprisingly, ImageMagick's convert utility also handles DICOM files. Converting to PNG worked well. Of interest, David Clunie's Medical Image Format Site.